OJS is open source software made freely available to journals worldwide for the purpose of making open access publishing a viable option for more journals, as open access can increase a journal’s readership as well as its contribution to the public good on a global scale. OJS has been. According to PKP, the developers of OJS, at least 24.000 scholarly journals use the Open Journal System, even though only 5.700 of these journals published content in 2013. 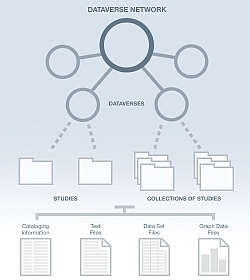 The Dataverse Network in contrast is an open source application to publish, share, reference, extract and analyse research data. It facilitates making data available to others, and facilitates the replication of others research. Researchers, data authors, publishers, data distributors, and affiliated institutions all receive appropriate credit. The main goal of the Dataverse Network is to solve the problems of data sharing through building technologies that enable institutions to reduce the burden for researchers and data publishers, and incentivize them to share their data. So the currently released plugin offers the advantages of two worlds: The plugin allows journals to facilitate research data sharing and archiving by setting up the plugin in their Open Journal Systems installation for authors to be able to deposit their research data at the same time as their article from the journal’s article submission system. The plugin works with Open Journal Systems (OJS) Version 2.3 and higher and is available on github.com.